With Valentine's Day 2016 just 11 days away, we decided to come up with a new romantically themed flower gift set to surprise your special someone with. Whether you are looking for a way to treat your spouse or capture the attention of your crush, the 12 Red Roses True Romance Gift Set will make for the perfect gesture to show your affection this Valentine's Day. Free next working day delivery is included as standard or you can even arrange for delivery on Sunday the 14th for a small surcharge. 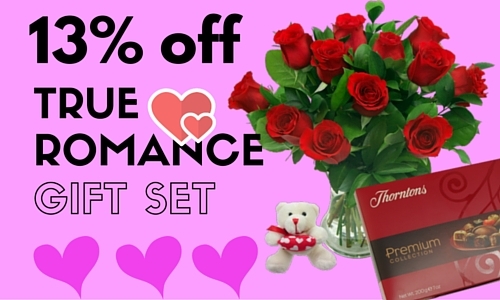 The True Romance Gift Set is currently on special offer with 13% off which means for a limited time only you can have this wonderful floral gift set delivered for just £45.99. You can also add a handwritten Valentine's Day card for just £2.95, the perfect finishing touch!